“The underlying goal of the program, however, is to impart Koch’s radical free-market ideology to teenagers. In the last school year, the class reached more than 1,000 students across Kansas and Missouri. 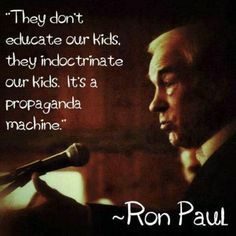 So, instead of teaching through objective examination of theory and practice, skeptical questions, and the use of balanced information for kids to formulate their own ideas, we indoctrinate? “During the 2012-2013 school year, YE’s credit-bearing class reached more than 1,000 students in 29 schools in Kansas and Missouri, according to the group’s annual report. Vernon Birmingham, YE’s director of curriculum and teacher support, told HuffPost that the course will be in 42 schools in the coming school year. Kansas, Missouri, Georgia….The creeps are creeping! THREE YEARS LATER (UNDER REAGAN) “A NATION AT RISK” WAS PRODUCED! COINCIDENCE? “Koch-funded think tanks provide many of YE’s course materials. Teachers are trained at Koch Industries headquarters and are required to read Charles Koch’s book The Science of Success. Guess whose quote that is? See the end of post for the answer! Is this from Fahrenheit 451 or 1984? “YE supplied Davis [a YE teacher from Kansas] with a syllabus, timeline and “all the handouts that you would need,” he told HuffPost. Before the school year started, he was given a thick binder of lesson plans, as well as flash drives containing quizzes and worksheets. There were also videos, PowerPoint presentations and scores of documents in Microsoft Word. Davis posted many of these resources online, offering the public a rare glimpse inside the highly structured curriculum. YE’s course materials reflect some of the initial thinking by the Koch associates charged with designing the course. In late 2009, the Koch group made a list of “common economic fallacies” that they believed should be repudiated. Objective? NO! Has objectives? Yes! “Today, to teach its most controversial lessons, YE often relies on videos provided by the Charles Koch-chaired Institute for Humane Studies, which operates out of George Mason University in Virginia. The videos are produced and marketed under an institute arm called Learn Liberty, which offers dozens of educational videos on libertarian and conservative topics. AND THEY SAY THEY ARE AGAINST PRESCRIPTED INDOCTRINATION IN AMERICAN SCHOOLS? “The struggling Topeka school district agreed to let YE train one new teacher a year and provide classrooms. YE would pay the teachers a stipend above their regular salary, supply them with classroom materials, arrange guest speakers and field trips, and provide students with scholarship opportunities, all at no cost to the school district. THE BRIBING OF SCHOOL DISTRICTS WORKS! “One of the fastest growing elements of YE is a program designed to keep students engaged in what is referred to across Koch-funded platforms as “the liberty movement” long after they finish the course. Launched in 2012, the YE Academy runs what it calls “economic ‘think tanks’ for high school students.” The academy relies on the same incentive that initially drew kids to YE: the chance to earn extra money. THE BRIBING OF STUDENTS WORKS! “Youth Entrepreneurs is just one piece of the Kochs’ slow creep into America’s schools. The larger Koch effort pushes forward with think tanks, university programs and teacher seminars as well. It’s not criminal because criminals are in charge. It’s not a partisan issue. Check the history on both sides of the aisle. This is a very creepy article, but one we might have anticipated from the excellent Jeffrey Toobin profile of Ted Cruz’s early education In free market principles in the next to most recent issue of The New Yorker. Read and weep! I’ve been wondering where all those corporate lib astro-turfers get their scripts from. Kochs are corporate conservative astro surfers. But politics doesn’t matter. Ne0-cons Neo-ibs Lib-libs or Con-cons Money buys the influence. I guess when the guy in the white house is a passive co-conspirator at best and a full blown collaborator at worst we aren’t going to see these Koch Brothers madrassas shut down any time soon. Kochs are corporate conservative astro surfers. But politics doesn’t matter. Gates like Ne0-cons Coleman Neo-ibs Lib-libs or Con-cons Money buys the influence. Thanks Lloyd… The book can use a bit or help too.